If you’re not from Minnesota, the first image that would probably pop into your head upon thinking of Duluth is a city by the vast Lake Superior, full of ships. Those of us who live here most likely associate Duluth with Grandma’s Marathon. The Grandma’s Restaurants sponsor many events in the city. In addition to their involvement in the community, their wide variety of restaurants have become popular with tourists and locals alike. 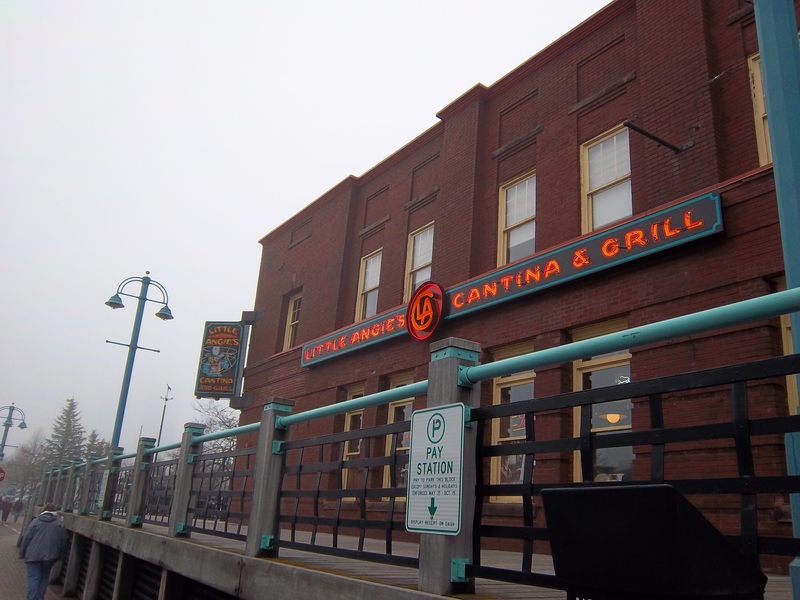 Little Angie’s Cantina and Grill, located in Canal Park of Duluth, MN, is one of 5 restaurants owned by the Grandma’s Restaurant Company. 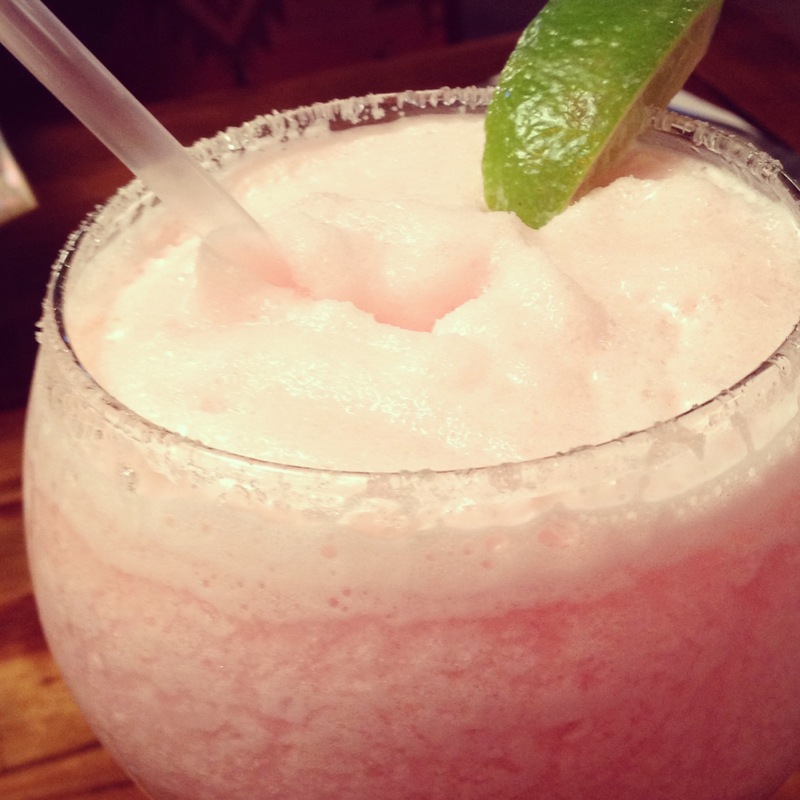 Angie’s serves up “south-of-the-border” fare, complete with a wide variety of Tex-Mex drinks. They have an extensive list of tequila ranging from $6-$100. The nice thing about having such a long list, is that customers can choose which tequila to sample in Angie’s house margarita. I love the fact that my fiance like trying new places just as much as I do. The benefit to this blog is that you can read about two totally different styles of taste in food. He tends to go with the more “traditional” American taste, i.e. anything with meat and cheese. I tend to choose off-the-wall and unique dishes that I wouldn’t find anywhere else. Before I share my thoughts on our entrees, I’m going to digress about an appetizer we shared and the margaritas. Let’s be real, we were at a Tex-Mex inspired restaurant and we had to order margaritas. With so many tequilas on the list, how could we refuse? Deciding to be adventurous, I went with a blueberry margarita and he went with a pomegranate one. We were pretty pumped about them, especially since they looked incredibly and perfectly slushed. Sadly, the excitement didn’t last long. Not only was the taste of tequila a little tame, but the margaritas didn’t offer much flavor. We actually had a hard time figuring out which margarita was the blueberry and which was the pomegranate. Seems like Angie’s could take a few tips from the Mexican Village. I know Mexican Village is a chain, but they know how to make one good margarita. Luckily for us, their house-made chips and salsa are pretty darn good. For a ridiculously cheap price of $0.99, you can order a large basket of their warm, house-made tortilla chips with two cups of their fresh salsa. I will brag about this one. 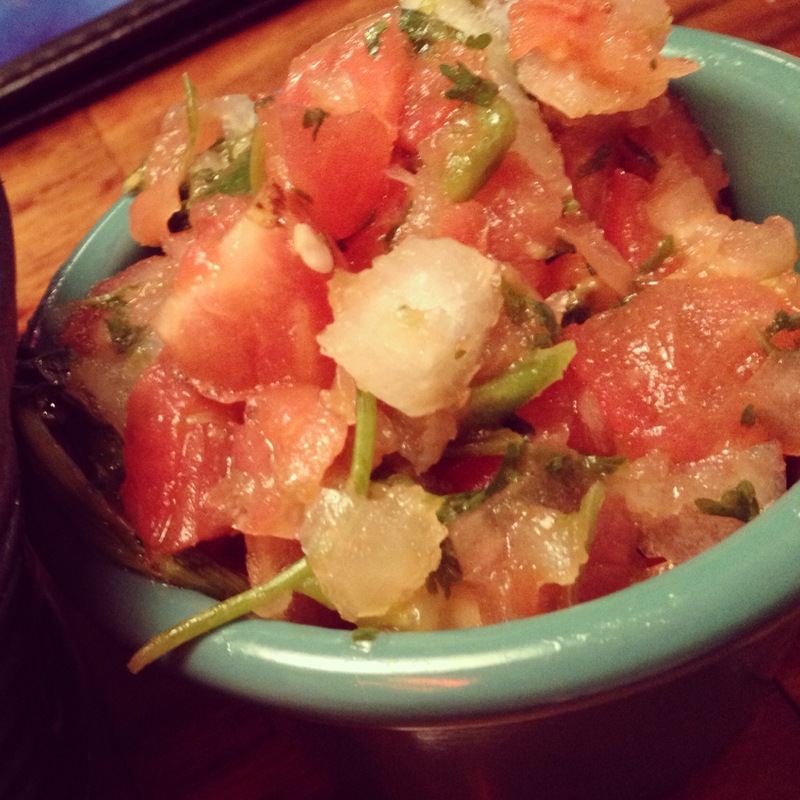 I love a good chunky salsa with fresh ingredients and Angie’s definitely delivered. This salsa didn’t have any trace of an oily texture and you could taste the fresh herbs mixed into the chunks of jalapeno and tomato. P.S. it has a nice kick to it too! This is a plus for two individuals who can’t get enough of extremely spicy food. For our main course, my fiance decided to go with Angie’s house specialty, the enchilada combo. 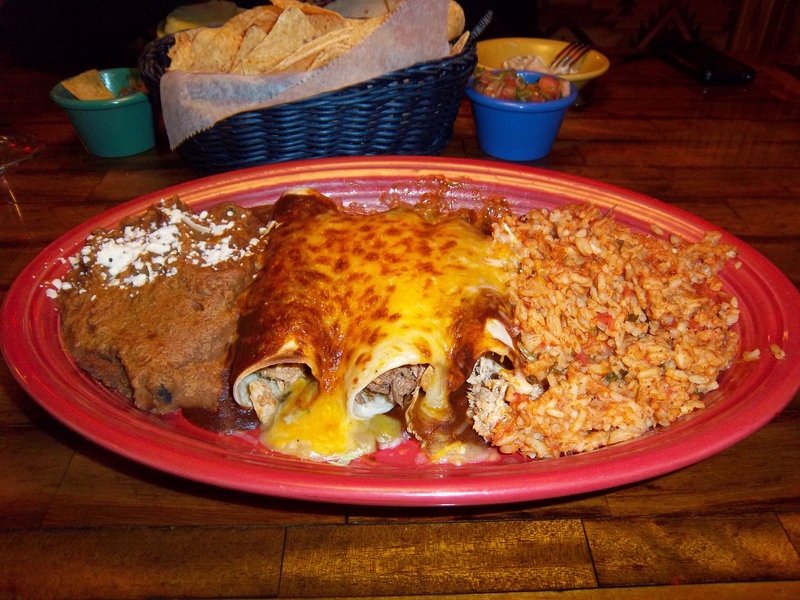 The combo consists of three corn tortillas stuffed with roasted chicken and shredded beef, baked, and topped with green and red chile sauce with cheddar and Jack cheese. They come served with rice and your choice of black or refried beans. Both he and I agreed, these were some well-made enchiladas. The cheese inside was not overly cooked and provided a nice, gooey texture when pulled apart. Unfortunately, you can see a little browning on the outside. Additionally, their meats were well seasoned. Overall, a very satisfying entree for anyone in look of tasty Mexican food. Wanting to try something unique, I went with the tropical tacos. Why, you may ask? I went with these because they contained fish and came with avocado (I’m obsessed) and a ton of tropical fruit! The tropical tacos consist of seasoned mahi-mahi grilled to perfection and served in a flour tortilla with lettuce and a tropical salsa: papaya, mango, pineapple, and strawberry. Served with a side of avocado sour cream, asparagus, and fresh fruit. Yep, I hit the summer-inspired jackpot with this one. I highly recommend it to anyone coming here. The fish didn’t have that harsh fishy taste that you can get with tuna for example. The mahi mahi really was grilled to perfection, which became a great compliment to the fresh fruits and vegetables served with this meal. Honestly, I was wondering how my tacos would taste with the fruit inside. I was surprisingly delighted. Just try it and you won’t be disappointed. Overall, we would probably stop there again. They have an outdoor patio that offers a great view of the lift bridge and of Lake Superior. The entrees definitely made up for the disappointing margaritas. We enjoyed the friendly staff and the casual, rustic atmosphere. For a link to the full menu, click here!